Midway through his rookie season, Seahawks running back Rashaad Penny finally found his burst. Cardinals running back David Johnson and NFL Hall of Famer Marshall Faulk helped. Here's how. This is a story about friends and enemies. Take Rashaad Penny and David Johnson, for example. Penny — the Seahawks’ elusive rookie running back, who has missed the past two games with a knee injury — was selected by Seattle in the first round of the 2018 NFL draft. But before that happened, he received some unexpected help. “(Rashaad’s older brother) Eli Penny was a running back here with me, and he told me that his brother was coming out of college and he was going to be a high draft pick,” explained Johnson, the starting running back for the Arizona Cardinals, in a phone interview with The Times last week. “He wanted me to just talk to him about being in the league and how to transfer over to being a professional and having responsibilities now — paying bills and how to manage money and how to control people that are suddenly trying to be involved (in your life). Since then, Penny and Johnson have talked multiple times every week. Johnson’s red and white Cardinals jersey hangs neatly in Penny’s locker, an outlier in an ocean of Seahawks gear. These NFC West running backs are division rivals. They’re foes, and they’re friends. In many ways, they’re mirror images. Johnson would know. Both players starred at small schools (Johnson at Northern Iowa and Penny at San Diego State). Both players were big backs who showcased their versatility on the collegiate level, even returning kicks. Both players struggled to receive carries early in their rookie seasons. Johnson, in fact, entered the 2015 campaign as the Cardinals’ fourth-string running back. A year later, he gained 2,118 total yards, scored 20 touchdowns and earned a Pro Bowl nod along the way. For both Johnson and Penny, success was not easily attained. The former kept improving, and eventually, the carries came. Now it’s Penny’s turn to prove he was worth the early pick. “I just had to prove I belonged,” Penny said. “I don’t want to be one of those guys that’s just sitting on the bench. I’m a competitive dude. I want to be in the situation Chris (Carson) is in. After Penny failed to receive a single carry in two games in October, the doubters piled up. The word “bust” was likely whispered in Seattle bars and barber shops. It was the 22-year-old rookie’s job to tune out the negative noise. “The biggest thing is trying to play football first and not trying to stress so much off the field,” Johnson said. “As an NFL player there’s so much more put on us. Now being in the league, especially him being a first-rounder, the coach and organization expects a lot of him. David Johnson is one of them. Faulk — a former San Diego State standout, Colts and Rams running back and 2011 Hall of Famer — took a particular interest in Penny while Rashaad was playing for his alma mater. He was watching on Nov. 11, when Penny — a Norwalk, Calif., native — produced a career-high 108 rushing yards and 9 yards per carry on the road against the Rams, with much of his family in attendance. Given that the 22-year-old rookie took a flame torch to Faulk’s former team, the two might have been considered enemies that day. But that didn’t stop Faulk from sending his promising protégé some words of encouragement after the game. The burst returned, and the rookie running back took off. 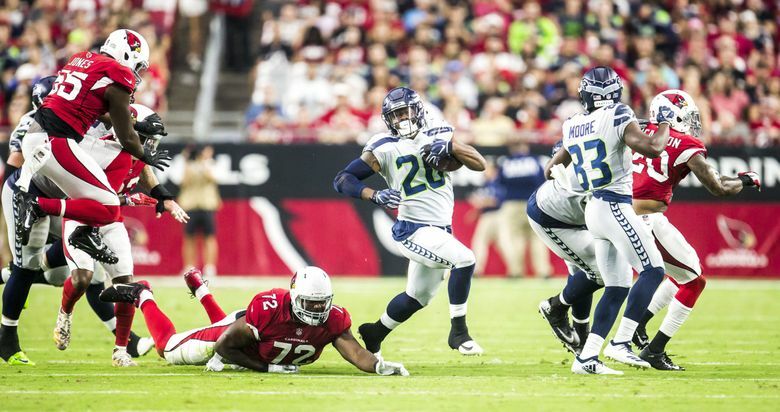 Penny averaged 6.8 yards per carry in his last five games, with the Seahawks winning four of them. He followed his instincts, which sometimes took him to unusual places, too. “The funny thing I remember noticing from him is he does some stuff that works that you normally don’t see in the NFL — him running to one side of the field and then cutting all the way back like in college or high school,” Johnson said. “He’s able to do that and still be effective doing it that way. Penny finally found his footing … and then the knee injury hit. Johnson — who missed the final 15 games of the 2017 season with a dislocated wrist — is an unfortunate expert on that subject. “I think the biggest thing is, don’t get discouraged, and make sure when you’re back you’re better than you were before your injury,” Johnson said. “Keep grinding. Keep getting stronger. Keep working on the muscles that don’t affect the knee, things you can do still in the weight room. According to first-year Seahawks offensive coordinator Brian Schottenheimer, Penny has improved in that area, regardless of the injury. “We’ve always known he’s talented,” Schottenheimer said last week. “People think it’s just going to turn on automatically for him. It doesn’t, especially when you’re playing multiple guys. It is a process, and Penny is far from a finished product. But in 13 games this season, the 5-foot-11, 222-pound running back has rushed for 413 yards and two touchdowns, while leading the team with 5.1 yards per carry. The Seahawks — who lead the NFL with 154.9 rushing yards per game — need a healthy, productive Penny to contribute to a pleasantly surprising playoff push. Coach Pete Carroll expects him to play when Seattle hosts Johnson and the 3-12 Cardinals in Sunday’s regular-season finale. If the Seahawks are lucky, the rookie running back will follow his friend/foe’s advice. He’ll suit up, stand out, reverse field — and shine.